Better than I remember it as being years back; good value. Had one bitter on, Formby IPA, don't remember that in the past. Perfectly drinkable and reasonably well kept (as opposed to exceptional). This pub is reasonably big with a large U shaped bar. I went for Tetley Dark Mild at 2.30 so reasonably priced and wasn't a bad pint. Bar staff and locals seemed quite friendly in here. Wouldn't say there is much memorable about this place. In fact compared to the pubs that are near it I would say it's relatively poor, but it's probably the best priced one in the immediate vicinity and you can't argue with the price of Stella at 3 pound a pint. Busy pub in the main shopping area of Liverpool. Not quite as nice an interior as the neighbouring Commercial, but not far off. The clientele were fairly senior, as were the bar staff. Beers were all keg options - Carling, Stella, Tetleys Smoothflow & Mild, Guinness, Carlsberg & Somersby cider. Could do with some cask ales. 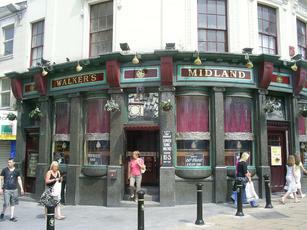 One of the nicest pubs I have been to in Liverpool, and I've been to quite a few, over the past 11 years. The ale is excellent, the staff very friendly, the music very good, 60's/70's, atmosphere is very good, and the landlady is one of the nicest I've ever met. I would recommend this pub to anybody. started in here last friday 3/2/12 nice pub inside, plays all our oldies music from back in our day, served quickly, went back in the evening before getting our train home, the atmosphere is good little bit busier but still ok getting served!